The new condos for sale are priced from the $400,000s with residences ranging from studios to three bedroom homes. The towering Element House will offer rooftop pools and a lounge along with a 7,000 square foot state of the art fitness center. Gemstone is the same real estate developer who built Manhattan Las Vegas on the Strip next to Park Avenue condominiums. 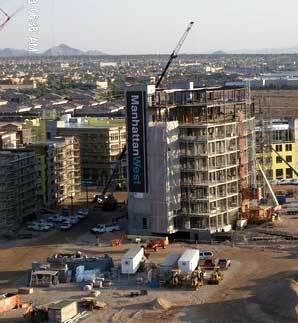 Last year they finished the 700 unit condominiums on south Las Vegas Blvd at a total investment of $230 million. General contractor for the mid rise is APCO Construction from North Las Vegas and designed by OZ Architecture from Denver, CO. When finished the 700 unit condominium project is expected to cost $350 million. Manhattan West condos for sale in Las Vegas topped off Element House.